Meet up at the Youth Café for an awesome series called “PROPEL” that looks at 4 things God uses to propel our faith. You don’t want to miss this! Its summer and you’ve got the time, so join a small group Bible study June-July with other HS students – led by some of our own HS! 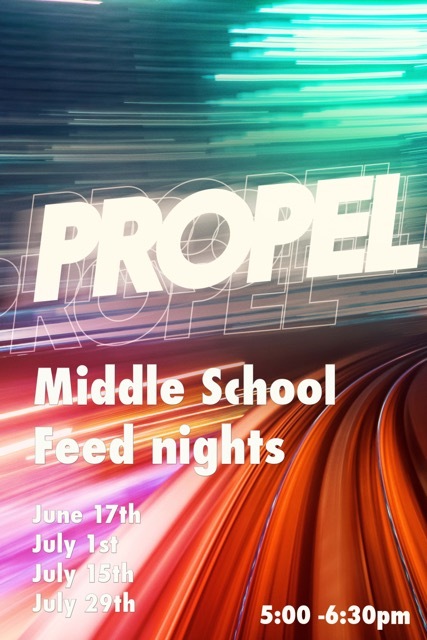 Get the full scoop by joining us for the Summer FEED Small Group Kickoff on June 10, 6:00-7:30pm in the Youth Cafe/Warehouse. 2015 Theme: Jesus the King (reading the gospel of Mark). You don’t need an extra book – just bring a Bible! Groups are labeled whether they are for guys, girls, or co-ed. Groups are always “open” to high schoolers, so share this page or invite friends! Pick a group that works for you and stick with it – don’t hop around! Groups meet at different locations – leaders will tell you location on June 10. Here’s our tentative list of groups: we’ll update final changes on June 10. Locations will be posted June 14.